Asparagus is a popular early-season vegetable. There are approximately 200 acres grown on 129 New York farms annually (2007 Census of Ag). The majority is sold for fresh-market, but a small amount (18 acres) goes for processing. 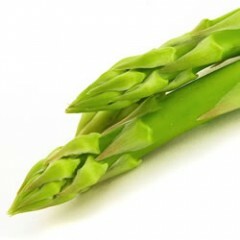 Asparagus is available from the beginning of May through mid-June in New York. It is a popular vegetable at farmer's markets, U-pick operations, retail stands and is also grown for wholesale markets. Commercial asparagus fields are generally planted with one-year old crowns; however, transplants can also be used. Fields take two years to establish, but afterwards can remain in production for 10 to 20 years. The DUAL MAGNUM Special Local Needs (SLN) herbicide, EPA No. 100-816/SLN No. NY-110004; a.i. metolachlor; Syngenta), label has expanded. Added Brussels sprouts (transplanted), cauliflower (transplanted), lettuce (head and leaf) and summer squash. Note, all these uses require signing a waiver/indemnification. Instructions on how to access the waiver follow.